Description of "Patanjali Yoga Sutras Essence"
The Yoga Aphorisms of Patanjali are a fundamental text on the practice of Integrated Living, Attaining Fitness and Joy, and preparing oneself for Liberation. Ten core principles of a human life have been enumerated, viz. c) Meditation - as learnt from a Master. The original Sanskrit text is given with a gist that closely mirrors the verse fidelity, a Latin transliteration and an English commentary. 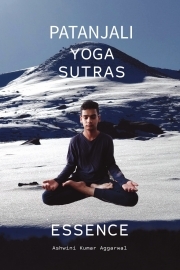 Reviews of "Patanjali Yoga Sutras Essence"